Setting out the house before the plans are drawn. Most builders prefer to have the plans drawn before starting the job but I preferred to start setting up some profiles to get the best layout for the small block of land. The block of land is very small and not a square block, I wasn’t sure of the boundaries and rules about boundaries. So I proceeded with the setting out of the profiles before the house had been designed. At the end of the day I had the information to draw a preliminary plan of the house. 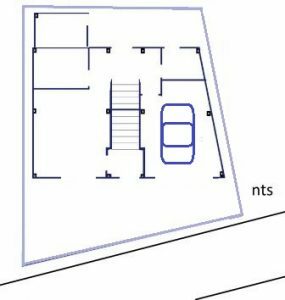 The style and general shape of the house had been decided, but that day I was more interested in the total acceptable length, width and height. This gave me a definite idea of the plan to work with and I was able to know the building could go ahead without any animosity between myself and the neighbors. In fact while fiddling around setting up the profiles all three neighbors gave their permission for me to break a rule, I was then able to place windows in the walls which come close to the boundaries. Setting out the job was the same as working in Australia except many of the stakes were round timber cut from saplings where as in Australia we use sawn timber. Timber for profiles. In Thailand there are timber merchants selling rough timber and poles that are used in building construction. See Construction timbers. Two and a half inch flat head nails are the preferred nails for construction work. After setting out the position of the house, it was easy to imagine the position of the sun throughout the day in different season. From there the shape and sizes of windows could be decided. 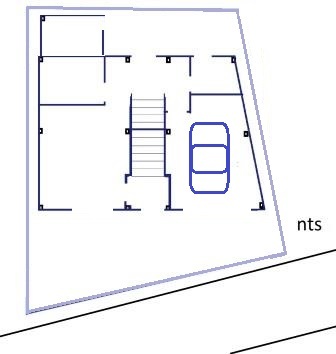 As the allotment is very small, the floor plan was made as big as possible. A survey team had set new boundary pegs. According to the plan of the allotment, there marks were not absolutely correct. Trying to use the survey pegs to line up two adjacent walls, I found that what was 90 degrees on the survey plan was not 90 degrees with the pegs. It was only an inch or so out and no one was surprised, I did check, no one had moved the pegs. To make sure that everything was inside my boundaries I kept about 10 centimeters inside my limits. Usually an Australian builder would be trying to keep everything as to satisfy the local government, here it seems the neighbors are the ones to satisfy. When the digging started things become a little crowded so I moved the profile timber back and fixed it to the fencing line. The block had been filled to a height slightly above the crown of the road so this made it easy to have the runoff water go in the right direction. I preferred that the ground floor be just 30 centimeters above the crown of the road. This was to keep the height of the house down and to have a gentle slope from the road, up and into the house rather than a step. The engineer later specified 40 centimeters but then conceded to my idea. A concrete retaining wall was needed and I started working on that. The date for the traditional ceremony was near and the engineer had not produced the drawings. By this time I had the completed plan of the building in my head and a brief talk with the engineer gave me the information needed to dig and fix the steel for the two piers. All went well, the brief ceremony was over and I had learned how to bend and tie steel. There is a page about foundations. Some footings reached to, but not beyond, the boundary lines. 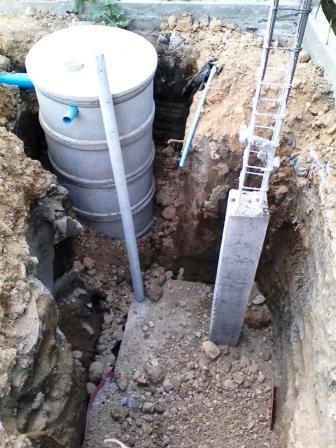 The image shows footing, concrete septic well and the foundation concrete for the small retaining wall. Some footings needed to be dug slightly under the retaining wall so as to get them out to the boundary line. Water was struck at two meters below the natural ground level, I was told this was common in Chiang Mai – it was not the wet season. Don’t buy the string in the very big yarns, they are value for money but the workers spend half a day winding and tangling it onto a spool. For 50 cents more you can buy it ON the spool. The holes near the boundaries were 1.6 x 1.2 and the holes in the middle of the block were 1.5 x 1.5 meters square. Go to the next page, Plans and Engineering.